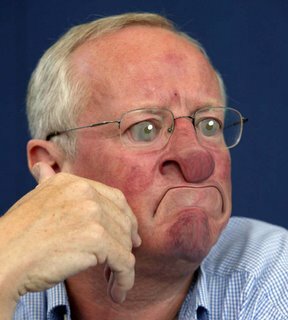 Robert Fisk is a journalist for the postmodern era. He does not bring the news to you, he brings his views to you. His views moreover, are fully formed before he enters the context from which he is reporting. His notoriety is such that he has added a new infinitive and participle to the lexicon - to fisk, and fisking. In our book Humbug!, we describe a well-known fallacy which fits fisk. Observational Selection is defined as follows: "The advocate pays close attention to confirming evidence, but ignores evidence which is contrary to his or her position." Note that in the distortature to the left, Fisk appears to be talking on a pretend phone to an imaginary informant. Could this be one of the reasons his reporting is so useless? Technorati Tagged - Fallacy, Skepticism, Observational Selection, Robert Fisk, Fisking.